This article contains Deseret alphabet characters. Without proper rendering support, you may see question marks, boxes, or other symbols instead of Deseret letters. In public statements, Young claimed the alphabet was intended to replace the traditional Latin alphabet with an alternative, more phonetically accurate alphabet for the English language. This would offer immigrants an opportunity to learn to read and write English, he said, the orthography of which is often less phonetically consistent than those of many other languages. :65–66 Similar experiments have not been uncommon, the most well-known of which is the Shavian alphabet. Young also prescribed the learning of Deseret to the school system, stating "It will be the means of introducing uniformity in our orthography, and the years that are now required to learn to read and spell can be devoted to other studies." During the alphabet's heyday between 1854 and 1869, books, newspapers, street signs and correspondence used the new letters, but despite heavy and costly promotion by the early LDS church, the alphabet never enjoyed prolonged widespread use and has been regarded by historians as a failure. The Deseret alphabet was developed primarily by a committee made up of the university's board of regents, members of which included church leaders Brigham Young, Parley P. Pratt and Heber C. Kimball. According to Brigham Young University professor Richard G. Moore, most scholars believe that Watt's contribution to the alphabet was the greatest; Kenneth R. Beesley goes so far as to credit him with "plant[ing] the idea of spelling reform in Brigham Young's mind" through a phonography class he gave after the death of Joseph Smith which Young attended. :6 In addition, Jules Remy reported that William W. Phelps helped "work out the letters." The Deseret alphabet was based on Isaac Pitman's English Phonotypic Alphabet, and in fact, Pitman's alphabet was nearly chosen by the Board of Regents as their preferred spelling reform. Before they decided on the Deseret alphabet, the attention of the board of regents was mostly focused on Pitman style alphabets, and in April 1847 Brigham Young nearly purchased 200 pounds (91 kg) of lead type to print books using Pitman's orthography. :7 The University of Deseret was incorporated on 28 February 1850; less than three weeks later, on 20 March, the new board of regents began to discuss spelling reform. Upon the alphabet's acceptance, its first user was its principal architect, George D. Watt, who began writing the meeting minutes of the early Bishops in a cursive form of it in 1854.:12 Almost immediately after its publication, church members began experimenting with it, and by 1855 travel writers Jules Remy and Julius Brenchley published a chart of the new alphabet which differed heavily from the 1854 version. Some early Mormons, such as Thales Hastings Haskell, began writing their personal journals in the new alphabet. :16 Remy further reported that during his time in Salt Lake City, he saw signs on the street and above shops using the new alphabet. After its approval by the board of regents, Brigham Young testified before the Utah territorial legislature that the new alphabet should "be thoroughly and extensively taught in all the schools." Some teaching in Utah schools did take place: John B. Milner taught the alphabet in Provo, Lehi, American Fork, and Pleasant Grove, while evening classes were taught in Salt Lake City and Farmington. Word of the new alphabet soon spread outside Utah, and most press reports in non-Mormon papers were critical. Other writers, however, acquainted with other phonotypic and stenographic alphabets, ranged from neutral descriptions of the new alphabet to praise. The Sermon on the Mount as it appears in the 16 February 1859 edition of the Deseret News. The covers of two primers published in the Deseret alphabet during the life of Brigham Young, the Deseret First Book and the Deseret Second Book. 𐐜 𐐔𐐇𐐝𐐀𐐡𐐇𐐓 𐐙𐐊𐐡𐐝𐐓/𐐝𐐇𐐗𐐊𐐤𐐔 𐐒𐐋𐐗 𐐒𐐌 𐐜 𐐡𐐀𐐖𐐇𐐤𐐓𐐝 𐐱𐑂 𐑄 𐐔𐐇𐐝𐐀𐐡𐐇𐐓 𐐏𐐆𐐅𐐤𐐆𐐚𐐊𐐡𐐝𐐆𐐓𐐆 1868. THE DESERET FIRST/SECOND BOOK BY THE REGENTS of the DESERET UNIVERSITY 1868. Considerable non-printed material in the Deseret alphabet was made, including a replica headstone in Cedar City, Utah, some coinage, letters, diaries, and meeting minutes. One of the more curious items found in the Deseret alphabet is an English-Hopi dictionary prepared by two Mormon missionaries. It sat unappreciated in handwritten form at the LDS Church Archives until 2014, when Kenneth R. Beesley, a writing system researcher and computer scientist, noticed its significance and transcribed it into standard written English. The final book the Mormon pioneers printed in the Deseret alphabet: a three part Book of Mormon. On left, the cover of volume one; on right, the Deseret alphabet chart in the book. An 1876 campaign ticket for the People's Party of Utah. The Deseret type is recycled to make a border. The "words" in the border are gibberish. According to Beesley, many have written that interest in the Deseret alphabet died with Brigham Young. This, however, isn't true; the alphabet was already regarded as a failure during Young's time. :29 Only 500 copies of the full Book of Mormon translated into the Deseret alphabet sold for US$2 each, and even Young realized that the venture was too expensive and even the most devout Mormons could not be convinced to purchase and study the Deseret edition books over the books in the traditional orthography. :27 In the winter of 1870, just one year after their publication, advertisements for the Deseret alphabet books were quietly removed from the Deseret News. Contemporary writers noted that thousands of copies of the US$0.15 and US$0.20 Deseret primers went unsold,:6 and historian Roby Wentz speculated that the LDS Church at that time had a "cache" of the primers in mint condition, which it was slowly selling off; according to him, one such primer sold for $250 in 1978. The Mormons had planned to use the profits from sale of the earlier books to fund printing of more books, and in anticipation Orson Pratt had already transcribed the complete Bible, Doctrine and Covenants, and John Jaques's Catechism for Children. Pratt had also prepared an apparent sequel to the primers, the Deseret Phonetic Speller. After the sales failure, however, none of these books were ever published and were thought lost until being rediscovered in a storage area of the LDS Church Archives in Salt Lake City in May 1967. Ralph Vigoda, a reporter for The Philadelphia Inquirer, has speculated that the completion of the Transcontinental Railroad may have contributed to the alphabet's downfall: non-Mormons, not loyal to Brigham Young, became a large part of the city, and without the religious motivation it would be difficult indeed to get them to learn a new alphabet. In a retrospective piece, historian A. J. Simmonds claims that the new railroad doomed the alphabet. According to him, easy access to "the whole literature of the English speaking world" rendered the alphabet useless. A transcription of Xkcd #739 in the Deseret alphabet. Modern digital typography has reduced the costs of typesetting substantially, especially for small print runs. As long as a freely licensed Deseret alphabet font and a font of the standard orthography have similar inked surface areas, printing a book in the Deseret alphabet using modern technology would have a similar cost as printing a book in the standard orthography. During the 1996 Utah Centennial celebration, an activity book for children was distributed, within which one of the activities was for a child to write their own name in the alphabet. The book says that a child who does this will be "the first kid in 100 years to write [their] name in the Deseret alphabet!" Also in 1996, Buffalo River Press published a reprint of the Deseret First Book, of which only 10,000 were originally printed. The entire Book of Mormon in the Deseret alphabet has been likewise reprinted, as only 500 copies from the original print run exist, and they can sell on eBay for ≈$7,500 (as of 2004). :47 In 1997, John Jenkins uploaded a free three part PDF of the so-called "triple combination", that is, a combined Book of Mormon, Doctrine and Covenants and Pearl of Great Price. Beginning around 2007, the Republic of Molossia (est. 1999), a micronation surrounded on all sides by the state of Nevada, used the Deseret alphabet on some signs to give their territory a more "foreign" appearance. The official website of the micronation cautions that any former or current "use of the...alphabet does not imply support of or adherence to LDS teachings [or] practices." In 2015, the micronation's stance towards the alphabet changed. After that date, the alphabet is officially described as a "formerly" used writing system and not a writing system in current use. John Jenkins has gone on to publish many classic pieces of English literature in the Deseret alphabet, such as Alice in Wonderland, Pride and Prejudice, and The Wonderful Wizard of Oz. The phrase "𐐆𐑌𐑁𐐲𐑉𐑋𐐩𐑇𐐲𐑌 𐐶𐐪𐑌𐐻𐑅 𐐻𐐭 𐐺 𐑁𐑉𐐨" (Information wants to be free) in five Deseret fonts. From top, Noto Sans Deseret, QueenBee Star, TuBeeRound, Times Bee and Analecta. All computers running Microsoft's Windows 7 operating system or newer can display the entire Deseret alphabet Unicode range as the glyphs are included in the Segoe UI Symbol font. Besides maintaining a Deseret input method for Windows, Joshua Erickson, a UCLA alumnus, also maintains a large collection of freeware Unicode fonts for the alphabet, which he collectively terms the "Bee Fonts." There also exist free software fonts for the Deseret alphabet. Google, through its Noto Sans project, the aim of which is "to support all languages with a harmonious look and feel", has also released a Deseret font under the name "Noto Sans Deseret". George Douros maintains a public domain font called "Analecta" as part of his Unicode Fonts for Ancient Scripts project, which supports the Coptic, Gothic, and Deseret scripts. Deseret glyphs are also available in the popular pan-Unicode fonts Code2001 and Everson Mono (as of version 5.1.5). Although the Deseret alphabet has letter case, the only difference between the minuscule and majuscule forms is that the majuscule forms are larger. The alphabet was designed to be able to write all of the vowels used in the dialect spoken in 19th century Utah. The vowel inventory has also been attributed to the fact that unlike other American pioneers, the Mormon pioneers were from New England as opposed to the American South. As such, many of the vowels in the Deseret alphabet have since merged in the modern era: they are no longer distinguished in many dialects of English. There have been several published versions of the alphabet. Most versions (including the versions used in The Deseret First Book, The Deseret Second Book, The Deseret News and The Book of Mormon) had only 38 letters, but some versions contained two ligatures, 𐐧 (ew) and 𐐦 (oi). In place of 𐐮𐐭 or 𐐷𐐭, 𐑏 was to be used; in place of 𐐱𐐮, 𐑎. In the 23 February 1859 edition of the Deseret News, the editors announced their approval of the two new letters and eventual intention to use them in the newsletter. However, due to the hot metal typesetting technology in use at the time, casting the new letters for use would have been a considerable expense, so it was never realized. Shelton using his schwa to handwrite the word "broken" (𐐺𐑉𐐬𐐿ı𐑌) (/ˈbroʊkən/). The standard way to render this word is as 𐐺𐑉𐐬𐐿𐐯𐑌 (/broʊkɛn/). Marion J. Shelton, an early Mormon missionary, proposed the addition of a new glyph to represent the schwa, a simple vertical line of the same height as other Deseret characters with a similar appearance to the Turkish dotless i (ı). The addition of this glyph did not catch on among his contemporaries, however, and no document outside of ones penned by Shelton makes use of it. :19–20 Shelton used the new glyph in an 1860 letter to Brigham Young reporting on a recently completed mission to the Paiute people. Syllabic values do not apply within words, although this was formerly the case. In early documents, Watt writes "people" as 𐐹𐐹𐑊 with the expectation that readers will interpret the first 𐐹 as /pi/, but the second 𐐹 as /p/. :13 This contextual value switching was soon done away with, so in later documents, while "bee" is written 𐐺, "bees" is written 𐐺𐐨𐑆. Hymn from the Deseret Second Book, printed in 1868. The first line of the hymn reads "I'll serve the Lord while I am young" (𐐌'𐑊 𐑅𐐲𐑉𐑂 𐑄 𐐢𐐫𐑉𐐼 𐐸𐐶𐐴𐑊 𐐌 𐐰𐑋 𐐷𐐲𐑍), and is pronounced as /aɪl sʌrv ð(ə) lɔːrd hwaɪl aɪ æm jʌŋ/. - Hello, how are you? – I'm doing great, thanks! – It was nice seeing you, but I've got to run! Take care! - 𐐐𐐯𐑊𐐬, 𐐸𐐵 𐐪𐑉 𐑏? – 𐐌'𐑋 𐐼𐐭𐐮𐑍 𐑀𐑉𐐩𐐻, 𐑃𐐰𐑍𐐿𐑅! – 𐐆𐐻 𐐶𐐲𐑆 𐑌𐐨𐑅 𐑅𐐨𐐨𐑍 𐑏, 𐐺𐐲𐐻 𐐌'𐑂 𐑀𐐪𐐻 𐐻𐐭 𐑉𐐲𐑌! 𐐓𐐩𐐿 𐐿𐐩𐑉! Oil floats on water, but mercury sinks below both. This is due to their relative densities. 𐐦𐑊 𐑁𐑊𐐬𐐻𐑅 𐐪𐑌 𐐶𐐫𐐻𐐲𐑉, 𐐺𐐲𐐻 𐑋𐐲𐑉𐐿𐐷𐐲𐑉𐐨 𐑅𐐮𐑍𐐿𐑅 𐐺𐐮𐑊𐐬 𐐺𐐬𐑃. 𐐜𐐮𐑅 𐐮𐑆 𐐼𐐭 𐐻𐐭 𐑄𐐯𐑉 𐑉𐐯𐑊𐐲𐐻𐐮𐑂 𐐼𐐯𐑌𐑅𐐮𐐻𐐨𐑆. I am in. As we go. On to it. Til the sun is in the sky. 𐐐𐐵 𐐌 𐐶𐐲𐑌𐐼𐐲𐑉 𐐸𐐶𐐱𐐻 𐐷𐐭 𐐪𐑉. 𐐢𐐴𐐿 𐐩 𐐼𐐴𐑋𐐲𐑌𐐼 𐐮𐑌 𐑄 𐑅𐐿𐐴. 𐐓𐐶𐐮𐑍𐐿𐑊, 𐐻𐐶𐐮𐑍𐐿𐑊, 𐐫𐑊 𐑄 𐑌𐐴𐐻. 𐐆𐑁 𐐷𐐭 𐐼𐐮𐐼 𐑌𐐱𐐻 𐐻𐐶𐐮𐑍𐐿𐑊 𐑅𐐬. 𐐓𐐮𐑊 𐑄 𐑅𐐲𐑌 𐐮𐑆 𐐮𐑌 𐑄 𐑅𐐿𐐴. There were two main handwritten forms of the Deseret alphabet: a cursive version and a printed version. Over the lifetime of the alphabet, the cursive form fell out of favor among most users of the alphabet and by 1856 no more cursive documents exist. :21 Its impact on the glyphs can however still be plainly seen in the loops of certain characters such as 𐑅, 𐑀 and 𐐼.:13 The earliest surviving versions of the Deseret alphabet, from 1853 (one year before its January 1854 approval), have printed and cursive forms side-by-side, suggesting that a cursive form was part of the plan from the very beginning. The cursive form of the Deseret alphabet was mainly used by two people: George D. Watt, and James Henry Martineau. :21 Watt, a stenographer, recorded several bishops meetings and wrote other personal documents in this cursive style. :13 A chart of the cursive form appears below. The blue glyphs represent how to write each character, while the top row of printed glyphs shows the corresponding Unicode reference glyph. The table below shows some examples of how the cursive form is written. Dropped vowels are marked in parenthesis. Dear Bro. I herein submit for your examination the result of much thought and extensive practice on the new alphabet since the Board of Regents last met. I candidly confess that I never did like the present construction of the alphabet. I was not left as free as I could have wished to be in the construction of it. [...] I am now thoroughly convinced that it is not the most expeditious method of writing and printing, but on the contrary it retards the hand in its onward course. His new alphabet closely resembled an 1853 publication of Isaac Pitman, containing only 33 letters. However, at this point, Young was still enamored with the original Deseret alphabet, and so he rejected the proposal and Watt continued to publicly promote the alphabet as part of his job despite his reservations. A fragment of Marion Shelton's Hopi dictionary, the source of his handwriting. This section shows translations into the Hopi language (Orayvi dialect) for words that start with the English phoneme /oʊ/. After 1855, no more cursive documents appear, and all surviving journals are written in block letters. :21 Marion J. Shelton, an early Mormon missionary who wrote a dictionary of the Hopi language in the alphabet, was a "typical" 40-letter Deseret writer,:19 and his style of writing is shown below. The Deseret alphabet was purposely designed so as to not have ascenders and descenders. :14 This was envisioned as a practical benefit for the alphabet in an era of metal type: after many uses, the edges of type sorts become dull, and narrow ascenders and descenders are most prone to this effect. While well intentioned, this lack has been described as a "catastrophic" mistake that makes type look "monotonous" and makes all words look alike. Some have drawn comparisons between the alphabet and the Old Turkic script, saying that writing in the new alphabet could be mistaken from afar as a Turkish tax list. President Young has decided that [the letters] are not so well adapted for the purpose designed as it was hoped they would be. There being no shanks (ascenders or descenders) to the letters, all being very even, they are trying to the eye, because of their uniformity. Other criticism of the design was harsher still. In an 18 December 1857 editorial in the Boston Globe, the alphabet was described as being "so arranged and named as to cause the greatest possible annoyance to outsiders" and the design of the letters as "incomprehensible as [...] the hieroglyphics of the [...] Egyptians." On 4 March 1872, The New York Times called the alphabet "rude, awkward and cumbersome." Some modern computer fonts and printed books have attempted to correct this perceived fault: in some of the books in John Jenkins' Deseret Alphabet Classics series, the font used adds a descender to 𐑉 and 𐐻 and an ascender to 𐐼 and 𐑇 among other tweaks. Officially, the Deseret alphabet was created to simplify the spelling of English words for the benefit of children and English as a second language learners. Some of the alphabet's contemporaries, however, posited an alternative motivation for its development: increasing the isolation of the early Mormons. Mormon Secretiveness.—The new "Deseret Alphabet" is completed, and a fount of pica type has been cast in St. Louis. Specimens of the type are published in the St. Louis papers, but they are unproducible in types that common people use [...] The ukases of Brother Brigham will hereafter be a sealed letter, literally, to Gentile eyes. Having obtained a copy of the Deseret News in 1859, the Richmond Dispatch disparaged it on April 25, writing "The Deseret News is filled with a lot of hieroglyphs. It seems to be [an alphabet] which the Mormons alone are to be taught." If our community were situated as others are, it might be Quixotic to attempt the introduction of this reform among us with the hope of carrying it into practical operation. But our position is unique, we are united. [...] Some have an idea that if a child be educated in the system of spelling and writing by sound it will be a detriment to it in learning the present system. [...] If they could find no better reading than much of the miserable trash that now obtains extensive circulation, it would be better if they never learned to read the present orthography. In such a case ignorance would be blissful. [...] The greatest evils which now flourish and under which Christendom groans are directly traceable to the licentiousness of the press. In another article, the News cited an example of the kind of literature Mormons would benefit from not being able to read: The Police Gazette. :35 Historians A. J. Simmonds and Roby Wentz contend that while this may have been a tertiary goal of the alphabet, a sort of "happy accident", the main purpose of it was simple orthographic reform. Simmonds notes that the teaching of English to foreigners was not a mere hypothetical to mask isolationist tendencies: 35% of the Utah Territory's population at the time was Scandinavian, with German, Italian and Welsh speaking people also making up a considerable percentage of inhabitants; therefore, communication between the recently baptized and the community was a real problem. Between 1855 and 1859, the way most people wrote the glyphs 𐑏 and 𐑎 changed, causing encoding problems when attempting to transcribe documents using the latter glyphs with Unicode. The Deseret alphabet (U+10400–U+1044F) was added to the Unicode Standard in March 2001 with the release of version 3.1, after a request by John H. Jenkins of Apple, making it one of the first scripts to be added outside of the Basic Multilingual Plane. :6 The letters 𐐧 (ew) and 𐐦 (oi) were added to the Unicode Standard in April 2003 with the release of version 4.0. According to Kenneth R. Beesley, who submitted the proposal to expand the encoding, "Unicode fonts based on the current heterogeneous collection of glyphs will be useless for any practical typesetting of 40-letter Deseret Alphabet documents. ":29 This is because the Unicode Consortium chose to use glyphs from 1855 as the reference glyphs, while by 1859 those glyphs were already outmoded and replaced with newer glyphs. Beesley thus recommends using LaTeX along with his Metafont desalph font to typeset Deseret text, but fonts which use the alternate glyphs for the two codepoints in question would also work for transcription of 40-letter Deseret texts written during and after 1859. On 25 February 2016, the Library of Congress approved an ALA-LC romanization for the Deseret alphabet. The table can be used to display approximations of titles in non-Latin scripts using the Latin alphabet for use in library catalogs that do not support non-Latin alphabets. ^ LDS.org: "Book of Mormon Pronunciation Guide" (retrieved 2012-02-25), IPA-ified from "dĕz-a-rĕt'"
^ a b c d e f g h i j k l m n o p Moore, Richard G. (2006). "The Deseret Alphabet Experiment" (PDF). Religious Studies Center. Brigham Young University. Retrieved 2017-01-06. ^ a b c d e f Wentz, Roby (1978). 38 Mormon Characters: A Forgotten Chapter in Western Typographic History (PDF). Los Angeles, California. ^ a b c d e f g h i j k l m n o p q r s t u v w x y z aa ab ac ad ae af ag Beesley, Kenneth R. (2004). "Typesetting the Deseret Alphabet with LATEX and METAFONT" (PDF). Presented at the 25th Annual Meeting and Conference of TeX Users Group – via CiteSeerX. ^ Young, Brigham (8 October 1868). Journal of Discourses. 12. delivered in the Tabernacle, Salt Lake City, UT. p. 289. ^ a b c d Zobell, Jr., Albert L. (1967). The Improvement Era. 70 no. 7. Salt Lake City: The Church of Jesus Christ of Latter-day Saints. pp. 10–11. ^ a b c d e f g h i Simmonds, A. J. (1968). "Utah's Strange Alphabet" (PDF). Sparta, Illinois: Major Magazines, Inc. Retrieved 2017-01-10. ^ a b c Spendlove, Loren Blake (2015-01-01). "Say Now Shibboleth, or Maybe Cumorah". Interpreter: A Journal of Mormon Scripture. 15. ^ Jules Remy, A Journey to Salt Lake City (London, 1861) 185. ^ a b "The Deseret Alphabet". Evening Star. Washington D.C. 11 June 1855. Retrieved 2017-01-16 – via Newspapers.com. (Subscription required (help)). ^ a b c d e f g h i j k l Beesley, Kenneth R. (14 August 2002). 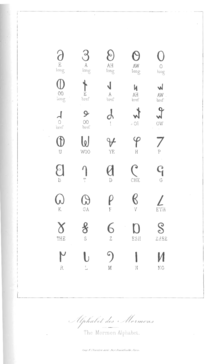 "The Deseret Alphabet in Unicode" (PDF). 22nd International Unicode Conference. ^ a b "Mormon Secretiveness". Lyttelton Times. 1858-01-23. Retrieved 2017-01-16 – via National Library of New Zealand. ^ a b "Affairs in Utah". The New York Times. 4 March 1872. p. 1. Retrieved 2017-01-16 – via Newspapers.com. (Subscription required (help)). ^ a b Schindler, Harold (1998). In Another Time: Sketches of Utah History. Logan, Utah: Utah State University Press. pp. 125–127. ISBN 9780874212426. ^ "Mormon Items—From Salt Lake". The Chicago Tribune. 10 May 1856. Retrieved 16 January 2017 – via Newspapers.com. (Subscription required (help)). ^ Headstone of John Thomas Morris, 1828–1855. ^ Beesley, Kenneth R. and Dirk Elzinga. 2014. An 1860 English-Hopi Vocabulary Written in the Deseret Alphabet. University of Utah Press. ^ Vigoda, Ralph (3 June 1990). "A churchman's failed mission: Language logic". The Philadelphia Inquirer. p. 2C. Retrieved 14 January 2017 – via Newspapers.com. ^ Krantz, Steven G. (2000-08-31). Handbook of Typography for the Mathematical Sciences. CRC Press. p. 149. ISBN 9781420036015. Print-on-demand digital technology allows the printing of a small number of copies of a document, at the moment of demand. In traditional typesetting, the cost of setting up the printer made it too impractical and costly to do small print runs. With digital technology this is now feasible and affordable. ^ Austin, Patrick (7 March 2016). "5 Ways to Save on Printer Ink". Consumer Reports. Retrieved 2017-01-25. Your choice of typeface can make a difference in ink consumption. [...] We got 27 percent more mileage when using Times New Roman rather than Arial, a default font in many browsers. Calibri and Century Gothic both outperformed Arial, as well. An option called Ecofont is designed specifically for frugality—it removes enough printer ink from its characters to stay legible while saving money. ^ a b Zion, Brion (1996). "Brion Zion's DESERET ALPHABET BOOK". brionzion.com. Wanderer Press, L.C. Retrieved 2017-01-06. ^ Deseret First Book (Deseret Alphabet) Historic Reprint (Later printing ed.). Salt Lake City: Buffalo River Press. 1996-01-01. ISBN 9781887727020. ^ Smith, Joseph (2015-01-31). The Book of Mormon (2015 Deseret Alphabet edition): Another Testament of Jesus Christ. ISBN 9781507628232. ^ "Triple Combination: Book of Mormon, Doctrine and Covenants, and Pearl of Great Price in the Deseret Alphabet" (PDF). Deseret Alphabet Portal. Adapted by John Jenkins. Cupertino, California. 1997. ^ Baugh, Kevin (31 January 2009). "The Deseret Alphabet". Official Website of the Republic of Molossia. Khamsin Molossia News. Retrieved 2017-01-09. ^ Peterson, Daniel C. (2015-07-11). Interpreter: A Journal of Mormon Scripture, Volume 15 (2015). The Interpreter Foundation. p. 40. ISBN 9781514843598. ^ "Republic of Molossia – Deseret Alphabet". Official Website of the Republic of Molossia. Republic of Molossia. Retrieved 2017-01-09. ^ Carroll, Lewis (2014-09-21). Alice's Adventures in Wonderland (𐐈𐑊𐐮𐑅'𐑆 𐐈𐐼𐑂𐐯𐑌𐐽𐐲𐑉𐑆 𐐮𐑌 𐐎𐐲𐑌𐐼𐐲𐑉𐑊𐐰𐑌𐐼): An edition printed in the Deseret Alphabet. Foreword by: John H. Jenkins. Evertype. ISBN 9781782010647. ^ Austen, Jane (2013-04-01). Pride and Prejudice 𐐑𐑉𐐴𐐼 𐐰𐑌𐐼 𐐑𐑉𐐯𐐾𐐲𐐼𐐮𐑅. Adapter: John H. Jenkins (1 ed.). ISBN 9781482672015. ^ Baum, L. Frank (2016-12-30). The Wonderful Wizard of Oz. ISBN 9781541134720. ^ "What's New for International Customers in Windows 7". Microsoft Developer Network. Microsoft. Retrieved 2017-01-19. In Windows 7, support for 10 new scripts is added: Braille, Deseret, New Tai Lue, Ogham, Osmanya, Phags-pa, Runic, Symbols, Tai Le, and Tifinagh. ^ Erickson, Joshua. "Deseret Bee Fonts". Joshua Erickson's Deseret Alphabet Pages. University of California Los Angeles Chemistry & Biochemistry Department. Retrieved 2017-01-06. ^ "Google Noto Fonts". www.google.com. Retrieved 2017-01-06. ^ Douros, George (1 October 2015). "Unicode Fonts for Ancient Scripts". Retrieved 7 January 2017. ^ Wood, Alan (27 October 2001). "Deseret – Test for Unicode support in Web browsers". Alan Wood's Unicode Resources. Retrieved 2017-01-19. ^ Smith, Joseph (1869). Book of Mormon in the Deseret Alphabet (1990 ed.). Corporation of the Presiding Bishop, The Church of Jesus Christ of Latter-day Saints. p. 2. ^ a b c d e Walker, Neil Alexander (2005). A Complete Guide to Reading and Writing the Deseret Alphabet (PDF). Joshua Erickson's Deseret Alphabet Pages. Lulu.com. p. 26. ISBN 978-1411648654. ^ a b c Beesley, Kenneth R. (2002-04-25). "Proposal to Modify the Encoding of Deseret Alphabet in Unicode" (PDF). Unicode Consortium. Xerox Research Center Europe. Retrieved 2017-01-04. ^ Shelton, Marion J. (3 April 1860). "Beloved brother, it is with heartfelt gratitude to my Heavenly Father..." (Letter). Letter to Brigham Young. ^ a b Watt, Ronald G. (1977-01-01). "Sailing "The Old Ship Zion": The Life of George D. Watt". Brigham Young University Studies. 18 (1): 48–65. JSTOR 43042710. (Registration required (help)). ^ Wells, H. G. (2013-06-14). 𐐜 𐐓𐐴𐑋 𐐣𐐲𐑇𐐨𐑌 [The Time Machine]. adapted by John Jenkins. pp. iii–iv. ISBN 9781482742404. ^ "Later from Utah". Richmond Dispatch. 25 April 1859. p. 1. Retrieved 2017-01-24 – via Newspapers.com. (Subscription required (help)). ^ "The Deseret Alphabet—Its Advantages". Deseret News. 18 August 1868. p. 2. Retrieved 2017-01-16 – via University of Utah: Utah Digital Newspapers. ^ "The Unicode Standard, version 4.0: UnicodeData-4.0.0.txt". The Unicode Consortium. Retrieved 2017-01-25. This is the first version of the standard with these characters: 10426;DESERET CAPITAL LETTER OI;Lu;0;L;;;;;N;;;;1044E; 10427;DESERET CAPITAL LETTER EW;Lu;0;L;;;;;N;;;;1044F; 1044E;DESERET SMALL LETTER OI;Ll;0;L;;;;;N;;;10426;;10426 1044F;DESERET SMALL LETTER EW;Ll;0;L;;;;;N;;;10427;;10427. Compare to https://www.unicode.org/Public/3.2-Update/UnicodeData-3.2.0.txt , where the last character in the block is DESERET SMALL LETTER ENG instead. Ivins, Stanley S. 1947. The Deseret Alphabet. Utah Humanities Review 1:223-39. Lynott, Patricia A. 1999. "Communicating Insularity: The Deseret Alphabet of Nineteenth-Century Mormon Education." American Educational History Journal 26 (1):20–26. Thompson, Roger. 1982. Language planning in frontier America: The case of the Deseret Alphabet. Language Problems and Language Planning 6:45–62. Wintersteen, Larry Ray. 1970. A History of the Deseret Alphabet. MA thesis, Brigham Young University. Young, Brigham (October 8, 1868), "Southern Missions—Deseret Alphabet—Relief Societies—Home Manufactures", Journal of Discourses Volume 12 By President Brigham Young, his two Counsellors, and the Twelve Apostles, 12, Liverpool: Albert Carrington, pp. 297–301 . Wikimedia Commons has media related to Deseret alphabet.